I am known most for my paintings of cats, so taking a turn and painting a series of fish paintings is a bit, well, ironic. I suspect that my cats rather enjoy the paintings, however. Why did I paint a series of fish paintings? It all started a couple of years ago when my friend Frank asked me to design a logo for him for a brewery that he was, at that time, in the early stages of developing. 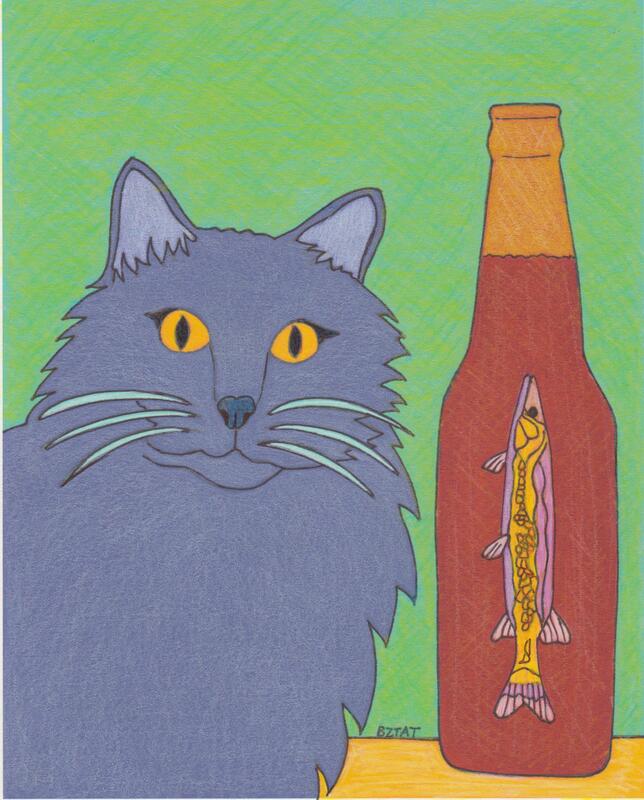 I had made a drawing of his cat Musky, named after the Muskellunge fish, and he wanted the fish in that drawing to be part of the logo. Frank is a scientific sort of guy. He came to brewing beer through the science of it. Working in the pharmaceutical industry for years, he developed a keen awareness of scientific methods and chemistry, and he began brewing beers in his basement. He decided to extend his basement hobby into a professional endeavor. Fascinated by various species of freshwater fish, he named each of his beers after a different fish. In keeping with his fish theme, Frank commissioned me to paint a sign for each of his beers and the corresponding fish to serve as a menu board in the taproom of his brewery. “I have a technique of laying the paint and that makes an interesting texture and that’s what these are,” BZTAT said. BZTAT is known for creating colorful pet portraits in pop art and contemporary folk styles. Freshwater fish presented a particular challenge. Freshwater fish aren’t exactly known for their bright colors, which the artists uses. Silver gray anyone? Not to say she and fish are strangers. She grew up in a household with fish tanks and exotic fish, and loved watching them. “They are just interesting visually,” BZTAT said. Muskellunge Brewing Company‘s taproom opened this past week to rave reviews (Follow Muskelluunge Brewing Company on Facebook and Instagram). The beer, and the fish painting/signs were a big hit! If you are in the Canton area, I hope you will stop in, sample some of the finest craft beer in Ohio, and see the artwork. The brewery is located at 425 5th St. NW Canton, OH 44702. Having an art studio at Avenue Arts Theatre and Marketplace gives me access to a classroom, and I intend to put it to good use! In fact, I have already scheduled my first art classes. Do you have a 7-11 year old who is creative? I am offering a Kids Art Adventure! at Avenue Arts Marketplace and Theatre beginning July 22, 2017. The class is limited to 10 students, so sign your artist up today! Participants will explore their creativity using a variety of art materials and media. Emphasis is on having fun with creativity! I look forward to creating great art adventures with your young artist! Click on the button below to register them for this fun end of summer art activity! Visit me in my new art studio in the Canton Arts District! Over the years, I have occupied a number of studio spaces in the Canton Arts District. I have been working out of my home of late, though, and I have been yearning to have a more public space to work and share my art. The perfect opportunity opened up for me, and I am again returning to the Canton Arts District! I welcome you to come an visit me in my new art studio/gallery at Avenue Arts Theatre and Marketplace in downtown Canton. I am having a Grand Opening during Canton’s First Friday this week. I hope that you can stop by and visit and maybe add to your art collection. This month’s First Friday is the 10th Anniversary for the event, so there will be lots of fun activities through the district. The first 50 visitors will get a free coloring page from “Artist BZTAT’s Color Me Cats” coloring book. I will have new artwork and some special offers to help you add to your art collection. BZTAT’s Grand Opening Return to the Canton Arts District! Stop by on First Friday, or come by anytime. I will be in the studio working on new projects most days. I look forward to seeing you!